President Muhammadu Buhari has identified corruption as the worst threat to Nigeria’s democracy, noting that the task of nation building rests primarily on the political elite. Buhari pointed out that leaders of advanced democracies have conquered the urge for primitive acquisition of wealth and have rather settled for service. The president, who spoke through his deputy, Prof. Yemi Osinbajo when he declared open the maiden annual political summit in Abuja, charged participants at the summit to evolve a moral elite that is prepared to make sacrifices and serve above self, adding that what Nigeria needed at the moment was leadership with ethical compass. “Democracy cannot heal the terrible human defect if politicians demand and take bribe, steal the money meant to provide drugs for our hospitals, schools for our children and roads for all,” he said. Buhari expressed sadness that the people’s dream to choose their leaders, has been thwarted by corrupt practices including purchase of votes. He commended the organisers, Save Democracy Group Africa for creating the platform for continued dialogue for political actors across party lines. Senate President Bukola Saraki and Speaker Yakubu Dogara in their separate remarks pledged the support of the National Assembly in the fight against corruption, noting that there was need for sacrifice across board. “The days of business as usual are over. Reckless spending of government’s resources, expenditures not budgeted for, procurement abuses and diversion of public monies for personal gains must be eradicated. As part of our agenda, the National Assembly is strengthening her oversight systems to ensure procedural and output integrity. All public spending must be within the Appropriation Act. 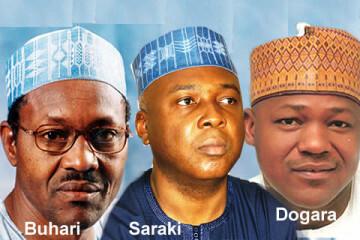 We can no longer afford waste,” Saraki said.